Our luxury house is set in private, landscaped gardens with magnificent views of the South Island's snow-capped mountains. Features a private cedar outdoor SPA POOL and Media Room with 60" Plasma TV, in addition to the main lounge. Fully equipped kitchen. The gorgeous open plan living and dining area features a double-sided fireplace, and luxurious feather duvets and comfortable beds complete the bedrooms. The house also has a great indoor outdoor flow to the BBQ outdoor area, SKY Sport and Movies, and free Wireless Broadband Internet – all you need to bring is some good wine and good company! 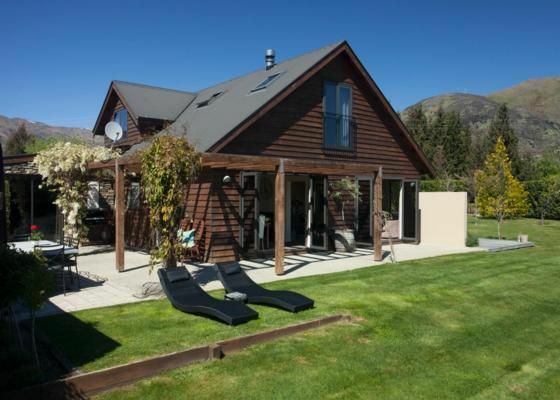 Wanaka Cottages - self-contained luxury Wanaka Accommodation for discerning couples, families and groups. Pets by arrangement with owner. We had a really great stay at Wanaka house. The house is beautiful and looks even better than the photos! There is a really great outdoor space to use, and we even got to stargaze in the hottub! Ash was very helpful and quick to respond, and there were cupcakes on our arrival! We would highly recommend to all! Beautifully laid out, with thoughtful details - like really clear guidance on how to use the expresso machine. The downstairs bedroom and ensuite gave perfect privacy for the grandparents, with the other 5 in our family still enjoying tons of space upstairs. And being right next door to such a sublime cafe was just great. Highly highly recommend a stay here. Thankyou! Beautiful property to stay in. Beautiful property to stay in. Great for families or a group of friends who are looking to spend some quality time together.